is not sewing fast enough. 2 fabrics, one stunning quilt! 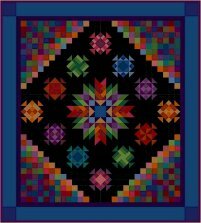 Use 2 contrasting fabrics or an ombre and print to create this popular quilt designed by Susie Weaver. 12 month program starting in January. The fabric for this lovely quilt by Nancy Rink for Marcus Fabrics is on the way to the shop! There are 10 kits that will include 8 new Marcus Fabric colors. please come into the shop and reserve your spot. Kits, instruction and classroom time will be available the first Saturday of each month from 11:00 to 1:00.
Credit cards will be kept on file and billed automatically each month. Feel free to contact the shop with any questions.